8 54 Chiu consented to navigate. In the person of Peter is found the answer to Ernest Renan s question. 5 A nation is, says Renan, a large-scale solidarity, constituted by the feeling of the sacrifices that one has made in the past and of those that one is prepared to make in the future (19). 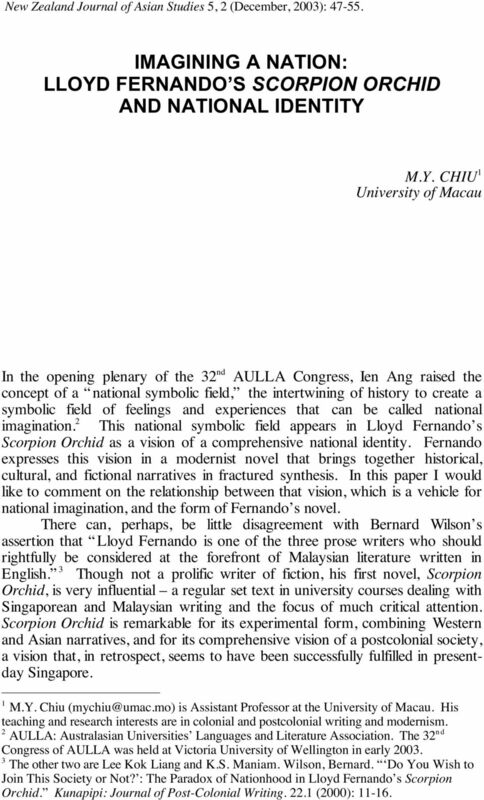 Scorpion Orchid is an embodiment of the desire for a constructive multi-culturalism one in which a new unity is forged from diverse historical and cultural experiences. 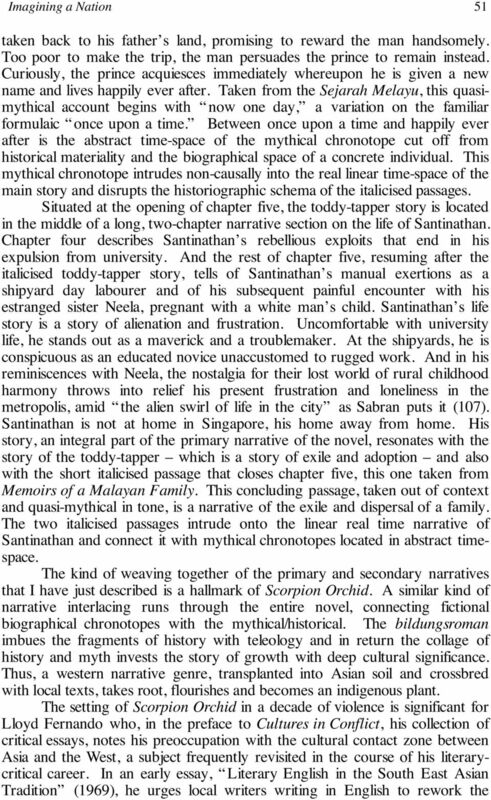 This gathering together of history and culture into the fictional space of the novel is an attempt to give these elements teleological coherence. The knowledge of the past (historical knowledge) and knowledge of myth and folklore (cultural knowledge) are combined with knowledge of Western modes of fictional representation. 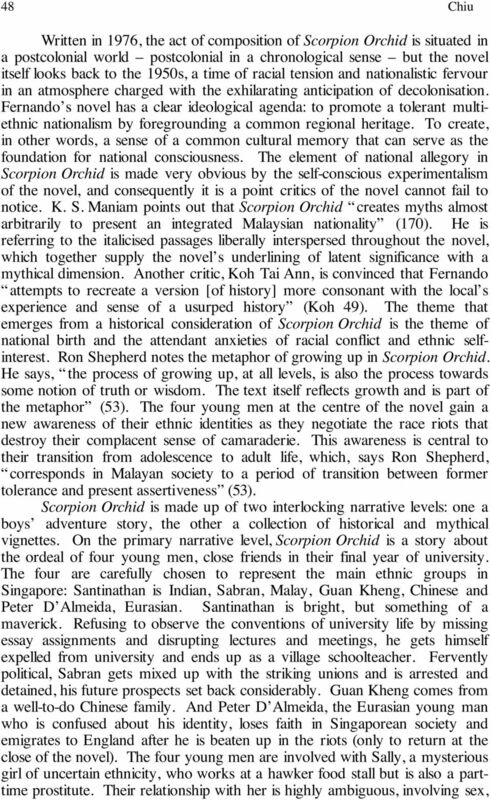 Formally, then, Scorpion Orchid incorporates Western and Asian discourses to recast in an Asian context the Romantic notion of a community growing out of the past to fulfil its destiny as nation. It is in this sense that Lloyd Fernando has mobilised knowledge to produce a nation. References Anderson, Benedict. 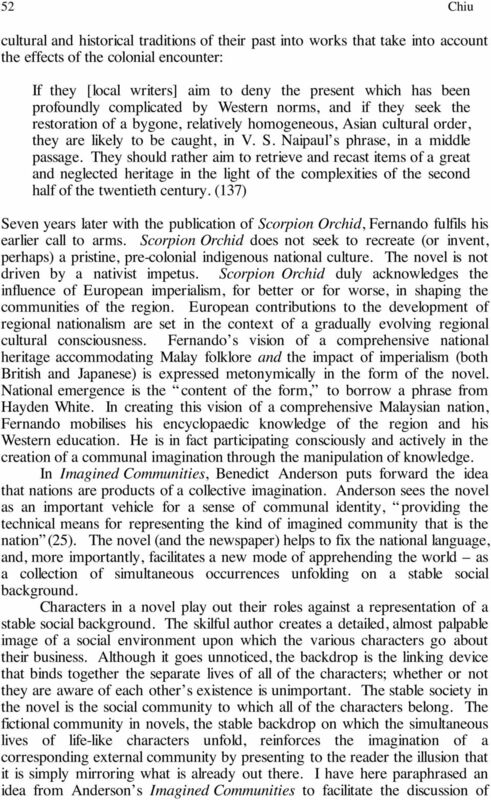 Imagined Communities: Reflections on the Origin and Spread of Nationalism. UK: Verso, Bakhtin, Mikhail. Speech Genres and Other Late Essays. Trans. Vern W. McGee. Eds. Caryl Emerson and Michael Holquist. 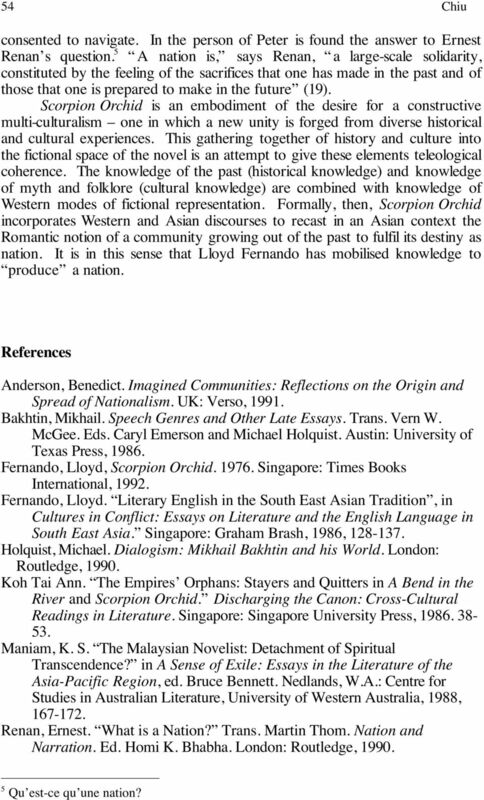 Austin: University of Texas Press, Fernando, Lloyd, Scorpion Orchid Singapore: Times Books International, Fernando, Lloyd. 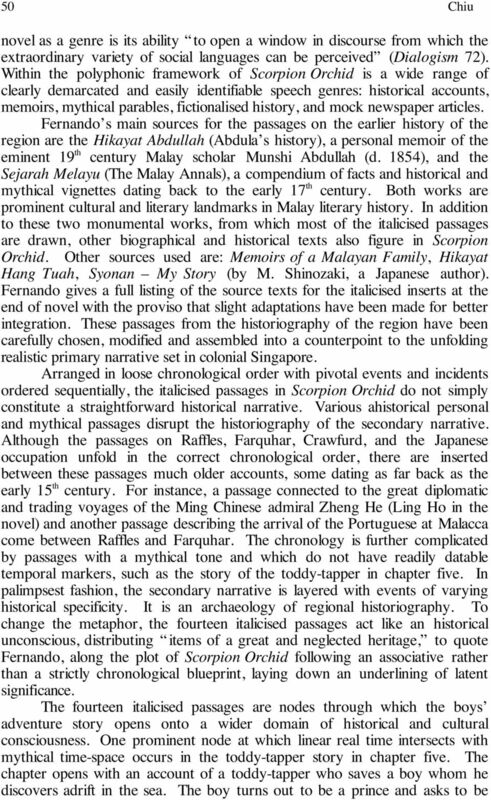 Literary English in the South East Asian Tradition, in Cultures in Conflict: Essays on Literature and the English Language in South East Asia. Singapore: Graham Brash, 1986, Holquist, Michael. Dialogism: Mikhail Bakhtin and his World. London: Routledge, Koh Tai Ann. The Empires Orphans: Stayers and Quitters in A Bend in the River and Scorpion Orchid. Discharging the Canon: Cross-Cultural Readings in Literature. 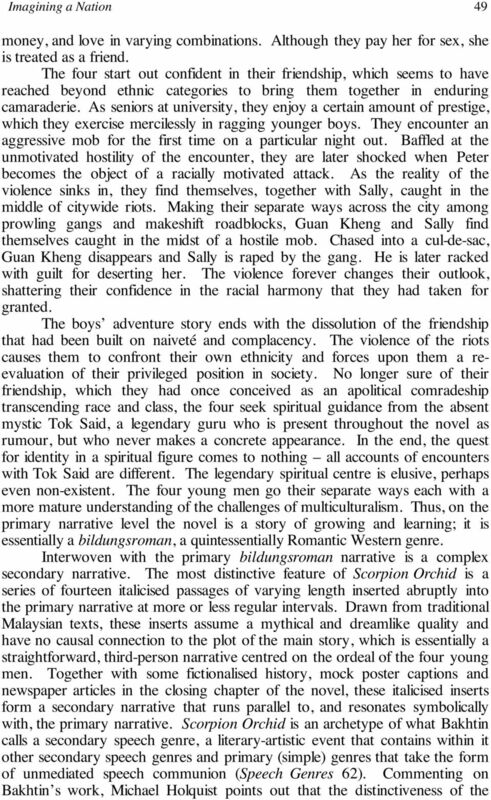 Singapore: Singapore University Press, Maniam, K. S. The Malaysian Novelist: Detachment of Spiritual Transcendence? in A Sense of Exile: Essays in the Literature of the Asia-Pacific Region, ed. Bruce Bennett. Nedlands, W.A. : Centre for Studies in Australian Literature, University of Western Australia, 1988, Renan, Ernest. What is a Nation? Trans. Martin Thom. Nation and Narration. Ed. Homi K. Bhabha. London: Routledge, Qu est-ce qu une nation? 9 Imagining a Nation 55 Shepherd, Ron. Growing Up: A Central Metaphor in Some Recent Novels, in The Writer s Sense of the Contemporary. Nedlands, W.A. : Centre for Studies in Australian Literature, University of Western Australia, 1982, White, Hayden. The Content of the Form: Narrative Discourse and Historical Representation. Baltimore and London: The Johns Hopkins University Press, 1987.